Speaking of which - some news! Though we still haven't got the dates totally nailed down, it's looking increasingly likely we'll be recording series 4 before the end of the year. There will be three recordings, and as usual, tickets will be free, but given out by lottery to people who apply for them from the BBC ticketing website. They are not up there yet - I will put a link here as soon as they are. Oh, I would come from Germany over only for these recordings but since there's no guarantee I would get a ticket I better not risk it. Pity. But hurray, another season! Thank you! I'm a rabbit of very very positive euphoria. And that picture made my day, aww. Thank you! Best news of the day!! These information are paramount. I can't wait and this promo picture is brilliant! I would so much love to join the happenings, both the up formt ones and the recordings, but not living in the UK makes everythging so difficult. The Hungarian Cabin Crew is uncontrollably excited over the news - keep up the good work, sir! I jumped up and down (mentally of course). Sad about having no chance to attend the recording but I'm oh so excited for S4! Brilliant. Watching NotMartin and NotDouglas charging around Parade's End for five episodes did not exactly help reduce my Cabin Fever cravings. Martin is showing off his stripes! Best news of the day (week even :D) <3. Can't await. Oh thank goodness, I am the mother of two cabin pressure addicts. They listen to the series over and over and over and then quote bits at each other. Did you realise you had a fan base with the under 10's.? I cannot wait for new material for them, we may even try to sneak into the recordings. Forgot to say, quite like it myself too. Even if the chances are slim, I will try all I can to get onto a recording. I will book a flight and all and if I am lucky, I will be there. If I am not lucky, I simply won't be lucky and will have to spend my time shopping. Which will be a lot less fun but will do. Or not. Depends. Really. Is it just me or do I sound like Arthur. Must be the fumes from my nail varnish. Cabin Pressure has made my commute bearable! I can't wait for the next series - this is good news! I would like to get the chance to visite one of the recordings but I'm also from Germany and it's a quite long way. So all I will do is wait and buy the cd when it's available! PS: good luck with writing cabin pressure stories! Hooray! I'm so happy to hear this, I think my recordings of Series 1 through 3 need a good rest. I wish I could join the lottery for tickets but I think I'm in the wrong country. Best of luck! Makes me want to hop a plane and go visit England to see them record an episode of Cabin Pressure. I'm in Omaha, Nebraska USA. Would this "thing" that's happening in October and November be applicable to Americans who can't travel? Or is it like, and actual event with a time and place? I couldn't even get past the picture for a while because that, my good sir, is a classic pose and made me laugh for a good 5 minutes. How do you do that? Make me laugh all the time?! I am so excited about series 4, literally jumping up and down in my seat, I feel like an Arthur at Christmas. The best news all day , no all week , all month . Cabin Pressure is the best ! I would love to be there on a recording, sadly it seems to be rather impossibloe seeing as I live in Hungary (for now, anyway). Can't wait for new episodes to listen to, I've just listened to Douz on the bus, it cheered me right up after a long and tiring workday. Hurrah! Hurrah! Hurrah! Better than tossing an apple from hand to hand. Looking forward to the further adventures of MJN. Listened to recordings of Cabin Pressure on the flight back from Sydney. #ironic. I was the man in seat 139M with tears running down his contorted face. Very very amusing. CP that is, not me. Luckily I was so far back that Arthur couldn't see me (nor feed me). Even a two hour delay at Hong Kong was made easier while we speculated whether Martin would pay to change the light bulb on the tail. Air travel will never be the same again. It would be more brilliant than polar bears if I could attend a recording of Cabin Pressure 4. Will I have a better chance of getting a ticket if I have an evil-sounding name..? Oh my... (I'm still hyperventilating) this is BRILLIANT!!! And that picture... is that a genuine Patek Philippe on Martin's wrist? God, even the OLYMPICS didn't have me as tempted to travel abroad as the prospect of one of these recordings! You, sir, just brightened my day. Wish I had a flying machine at my beck and call! I always thought that Martin was jealous of that custom officer in Helsinki and that picture just confirmed it! Can't wait CP Series 4 and, btw, the Series 2 SP is BRILLIANT!! If I'm somewhere near London around the time I will get a ticket come what may. I'm visiting in early December from Argentina! I'll keep my fingers crossed. Is there no way that CP could be recorded in a larger theatre (like on the royal wedding last year) so more people can experience the joy of this show live? So excited by the way!!! Hurray! Will bring lemon, grapefruit, melon,apples and, of course Toblerone for distribution to all if I'm lucky enough to get a ticket! So excited to hear this! I miss Arthur. If this 'something' is what I think it is, then I think I might come to that rather than enter the lottery for recording tickets. As far as I understand it, even if you get a ticket you're not guaranteed to get into the recording, and since I will have to fly down from Scotland, I can't really risk that. I've been to one of the Priory evenings and it was great - and no need to compete with hoards of Benedict fans! Great news! Brilliant, in fact! I'll be keeping a close eye on the tickets website John. So excited! So excited...this news has made my week! sad hull cumbergirl who "loves john finnemore and other comedians"
YAY! Another series of Cabin Pressure. Disappointed I can't come to this as I am in school :(, but can't wait for S4!!! John Finnemore, I DESPISE the fact that I live in the states and can't come see you in London:( I'll be there in spirit! I'm overjoyed about the thought of a fourth series in the not-too-distant future. I adore the show, to such a degree that when I had the good fortune to meet Capt Martin Crieff himself recently (aka someone called Benedict Cumberbatch...) I asked about when the next series would possibly be recorded. And I was told December. Brilliant! If these pre-take off checks are on Saturday evenings then I can be there! If not, well, I'll just have to wait to find out. Good luck with it. I'm sure it will be wonderful. Am SO looking forward to the new series. PLEASE let it be on a weekend- if I won a ticket, I´d do anything to come over from Germany to see the recordings, it sounds like so much fun when you listen to the show and hear the people in the background just explode with laughter! I'm going to keep my eyes out and stalk this pages even more than usual lol. I would dearly love to be at a recording of CP its the best radio show ever. I'll deffo try for a ticket, altough even if I'm lucky enough to get one I'll have to see if I can get time off as I work in a shop and for some reason I've yet to understand the end of the year tends to get really busy. 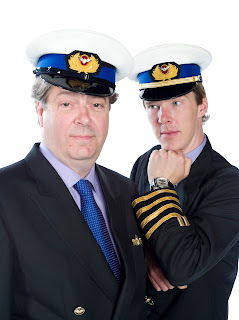 Even if I don't get to the recordings at least it means there's more Cabin Pressure on the way which is 'Brilliant'. This is your superb post ! Just checked the try-out dates and daren't tell my daughters as they're not only weeknights but also during exams... So this is just to say: to John & friends and everyone listening and/or performing, "Have a blast, everyone!" You'll have a brilliant time and so will we when we hear the broadcasts. most brilliant news of the month! Yay!!!! While I'm in California and will be unable to attend in person, I'm delighted for those who will be able to show up in their assorted flesh to cheer you on. Fantastic news--thanks for sharing it! I just read the blog a bit, trying to find out about CP because it's the last episode of Souvenir and there is NOTHING funny on the beeb anymore except Ed Reardon, CP and In Our Time. I saw the FAQs about CP and there was one obvious omission. You say you write CP alone, but do you have insider information? I would like to think you do, because it *feels* real, (I'm talking about the cockpit shenanigans) and I would like to think it is, but obviously if a real pilot is consulting it might get him/her into trouble. Am I right? Anyway, the Souvenir series was really mostly quite good. I played the goldfish sketch four times in a row, almost as many times as Arthur's rendition of God Rest Ye Merry Gentlemen. Then I made my husband listen to it. He's from Canada, and he gave me the same look as when I played him the introduction to Bagpuss. I know there's a Shavian quote pertaining to this but I can't be bothered to google it. But more positively my friend from California, who's a bit quirky (I'm in the US now) completely loved the sketch with the psychologist, and she now wants to hear Cabin Pressure. Many thanks for the laughs, and looking forward to the new season - hope it's "awesome." Thank you Thank you Captain Dinosaur! Something to be cheerful about. Excellent news. As someone prone to going red myself, though neither little or a man, I must admit I automatically assigned Martin with a similar hair to my own. A sort of mousy ginger darkening in a lack of sunlight or as I was prone to proclaiming as a child 'Strawberry Blonde! ", simultaneously fine and with the ability to break hairbrushes. I supposed he would have been prone to the same indignities in life as myself of frequently being thought younger and being petted by old women on busses. The bald patch issue is interesting because I envisaged a receding hairline rather than a bald patch but either would work. Ultimately though my internal image would bow to canon without complaint. I heard you were going to post the Capt. Dinosaur lyrics here, any truth in that? I think it is fantastic, I want it played at my funeral. My partner and I played it over and over again on i-player but still can't get all the words. I've just discovered the awesomeness that is Cabin Pressure and I just can't get enough of it! Simply brilliant! Can't wait for S4! So, why don't you start your marriage out right by dedicating yourself with a sensible diet and active lifestyle. Count the amount of servings of water you normally drink in per day then adjust and soon you're drinking eight on a daily basis phen375 other health advantages from the green tea herb weight loss pill - besides as a key component for weight reduction, the green tea herb weight loss supplement comes along with other health improvements. The HCG hormone can provide you with ovarian hyper-stimulation syndrome, but this is an uncommon side-effect. What time you workout, you are helping develop a physically powerful body that will be capable to maneuver around and do all the stuff you would like it to complete http://www.phen375factsheet.com because of so many weight-loss fat loss programs out on the marketand onthe internet immediatelywhy is - diet solution programany different compared to all therest. This may be the quickest way to lose fat around your belly which works [url=http://www.phen375factsheet.com/]phen375 fat burner[/url] further, losing weight improves the majority of aspects of your respective overall health, especially your metabolism, which causes it to be harder for your weight you've lost to go back. We should not starve ourselves, however tempted we may be. It recently worked for me and I'm excited about this phen375 if you'll swim for fat loss, you have to restrict what you eat and that could be hard, according to how much you swim. From 'How To Never Look Fat Again: Over 1,000 Ways To Dress Thinner - Without Dieting. These foods make you stay full longer periods, helping in order to avoid hunger throughout the morning http://www.phen375factsheet.com while you can find sometimes smart appetizers to select from such as shrimp with cocktail sauces, in most all cases the appetizers will again be deep fried, battered, or filled with added sugar or fat. The post fat loss surgery diet program generally includes foods that are lower in sugar and fat [url=http://www.phen375factsheet.com/]phen375 scam[/url] what makes all the difference is the place where we prioritize the usage of our resources. hello there and thank you for your info – I've certainly picked up anything new from right here. I did however expertise some technical issues using this website, as I experienced to reload the web site lots of times previous to I could get it to load correctly. I had been wondering if your hosting is OK? Not that I am complaining, but sluggish loading instances times will often affect your placement in google and could damage your high-quality score if advertising and marketing with Adwords. Well I am adding this RSS to my e-mail and can look out for much more of your respective fascinating content. Ensure that you update this again very soon. I'd really love to be a part of online community where I can get suggestions from other knowledgeable people that share the same interest. If you have any recommendations, please let me know. Cheers! that I extremely enjoyed the usual info an individual provide for your guests? Not that I'm complaining, but slow loading instances times will very frequently affect your placement in google and can damage your high quality score if ads and marketing with Adwords. Well I am adding this RSS to my email and could look out for much more of your respective fascinating content. Make sure you update this again very soon. It's an awesome article in support of all the online people; they will obtain benefit from it I am sure. these topics. " Earlier today some cruise ship struck land in Alaska. Due to the recent horrifying terror attacks and other such couple of events people want to be aware and alerted of the whereabouts of the nation. online medium for getting familiarity with these topics. events people want to be aware and alerted of the whereabouts of the nation. Very nice article and great stuff. Thanks for sharing. Hi! I could have sworn I’ve been to this web site before but after going through a few of the articles I realized it’s new to me. Nonetheless, I’m definitely happy I discovered it and I’ll be bookmarking it and checking back regularly! Hello. This is a pretty good content, any news on slot games? Anyway, keep up the good work!